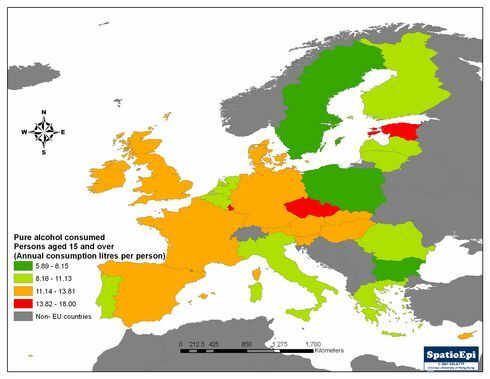 Map shows the level of alcohol (expressed as litre of pure alcohol) consumed by adults in European Union (EU) countries in 2003. The country recording the highest level was Luxembourg, at 18 litres per person annually, followed by the Czech Republic 16.2 litres and Estonia 16 litres. Many chronic diseases are associated with excessive alcohol intake. Examples included liver, cardiovascular, neurological and gastrointestinal diseases, gout, as well as nutritional deficiencies. Some studies had shown that moderate and sensible alcohol consumption may give health benefits. However, chronic consumption of excessive alcohol can lead to alcoholism and various forms of related condition with long term complications. Alcoholism is also known as alcohol dependence. According to The National Institute on Alcohol Abuse and Alcoholism (NIAAA) in the USA, alcoholism is characterised by 4 symptoms: craving, loss of control, physical dependence and tolerance. In addition, binge drinking is also under the public health spotlight. Binge drinking normally refers to a rapid, heavy consumption of alcohol within a period, or heavy episodic drinking, or even drink-to-drunk intentionally. It is often seen in young adults. Insensible drinking causes short term effect such as drink driving, car accidents, injuries due to aggressive behaviour, engagement in unplanned and unprotected sexual activity, loss of consciousness and many more.